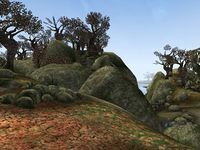 Aanthirin is a lush orange-green region in the Mournhold District of Morrowind. It contains Morrowind's largest lake, Lake Andaram, and is divided by the Thirr River as it flows out to the Inner Sea. Its largest settlement is the city of Old Ebonheart, though Almas Thirr and Hlan Oek are the largest settlements in the "true" region (see notes). As the central region of Morrowind, Aanthirin has many borders; from north going clockwise to south they are: Azura's Coast, Sundered Scar, Alt Orethan, and Deshaan Plains. From south going clockwise to north they are: Thirr Valley, Armun Ashlands, Roth Roryn, Ascadian Bluffs, and Ascadian Isles. Only the northeastern part is officially released. A list of places found in the Aanthirin region. Ebon Tower — The main Imperial hub in Morrowind, built on the ruins of the historical Ebonheart. These places are planned, in development, or partially complete and available through TR_Preview. Due to the ever-changing nature of unreleased content, only major locations on the concept map are listed here. Technically, Old Ebonheart is in its own region to allow unique regional sound effects, but in all other ways it is part of Aanthirin and so is listed here. This region was originally called Thirr River Valley. Before being renamed to Aanthirin, the name was almost changed to Middle Thirr instead. For more background information, see Tamriel Rebuilt's planning document for Aanthirin. This page was last modified on 4 March 2019, at 05:22.